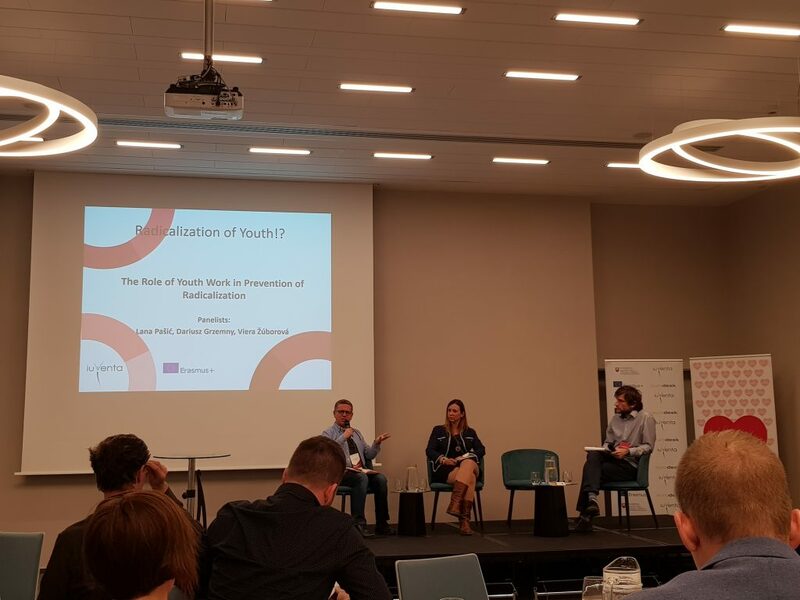 Lana Pasic and Dariusz Grzemny are opening the Conference held in Bratislava discussing the understanding of radicalisation and the role of youth work. Dariusz is raising a very important question about the fact that being radical for youth can be positive as this can lead toward a social change, can bring to innovation, can lead to revolution. Radicalisation is very political as topic and for this reason sometime youth work prefers not being associate to. Radical is not a negative as such, but the issue that we are analysing is when for promoting specific values or topics somebody use violence. Radicalisation that is leading to violence acts is then craetion social instability. 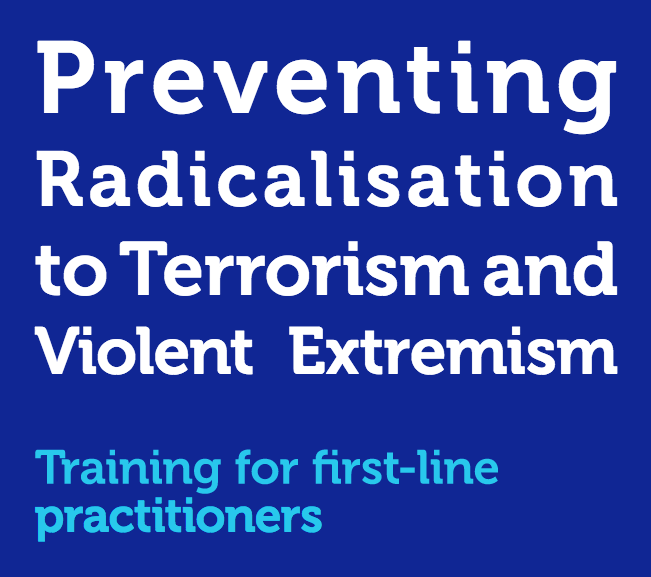 Which kind of methods are the most interesting ones for fight or overcome violent radicalisation? The speakers are sharing with the audice the importance of the narrative and share the experience in first person as methodology that can intercept the attention, the feelings and the understanding of the audice and specially with youth work. During these three working days, we will explore several angle of radicalisation and path that have been raised by youth workers, youth policy developements and researchers. 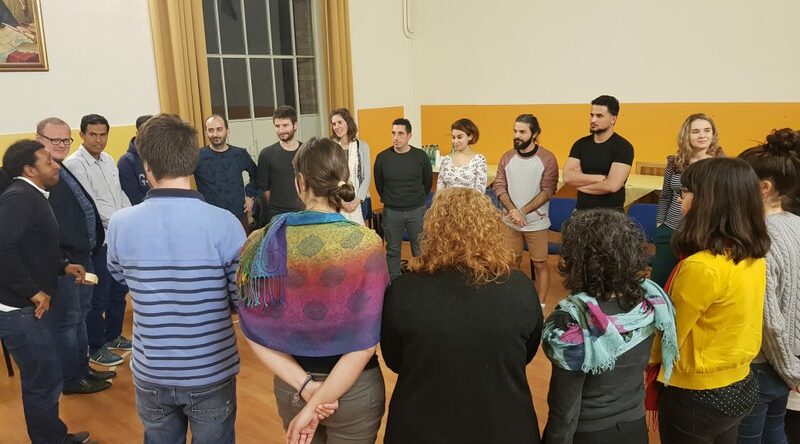 “Youth work against Violent Radicalisation: competencies developement” in Macerata brought twenty-four participants to visit two NGOs in Macerata that are running projects for supporting the community and including migrants and asylum seekers. Le Friches organisation is promoting local youth work and projects that are supporting the citizens to “feel back” their communities, they create spaces for common living. During the visit the participants had the opportunity to get to know in detail the different projects that the organization was running. And how throught a process of co-creation of public spaces with children, they could engage their families and other community members to develop the sense of belonging and ownership to their community. This approach based on the development of community participation on the public space was an interesting and innovative approach to work on the theme of preveting violent radicalization and building community resilience. GUS was presenting their work with asylum seekers and migrants at local level. The organisation is very active since the fact that happened in Macerata. Beneficiarias were victimis in the shooting and GUS activeted serveral services for supporting them, but also for providing inclusive answers to the local community. 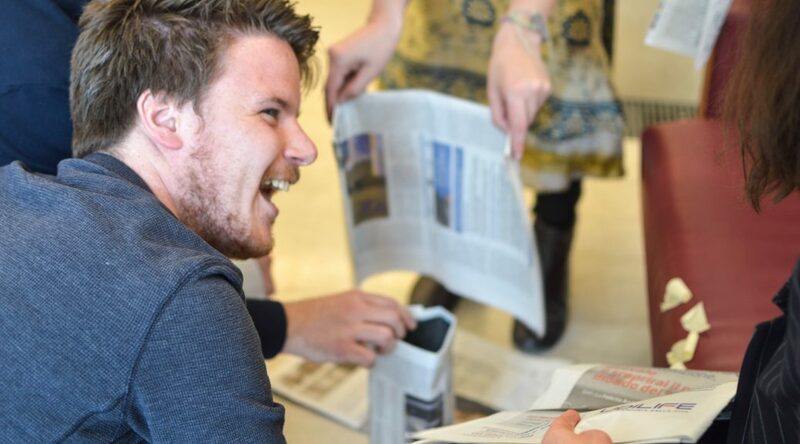 GUS is active working for provide spaces of open dialogue among the different parts of the communities and to bridge them. Community resilience is an important topic for their local work. The field visit provided the opportunity to better understand the link among the impact of political and social context on creating condition of radicalisation leading to violence. In Macerata started the second training day discussing the “challenges of youth work preventing violent radicalisation”. Youth workers from more than 20 different countries shared and confronted their daily experience and their challenges. The lack of clarity and agreements about the national and local priorities is a challenge as doen’t allow to provide youth worker a clear framework of work, This is also creating and supporting, often, feeling of insecurity and fears within the local communities. The topic of violent radicalisation, in fact, it is very sensitive and often connected with personal experiences, prejudices and sometime a not deep undertanding of the topic as such. The local authorities as well local institutions not always offer support to the youth work initiatives and role in the frame of preventing work, This is supported by a fragile legal system in some countries when comes to speak about radicalisation: the focus is more on security rather than prevention in general. Among challenges, youth workers mentioned the personal and professional developement how to provide answer to these challenges. Competencies are needed to tranform the individual and community approach toward this topic. Competencies are needed to develop community resilience for strengh the youth and empower their critical thinking and have their indipendet thoughts. 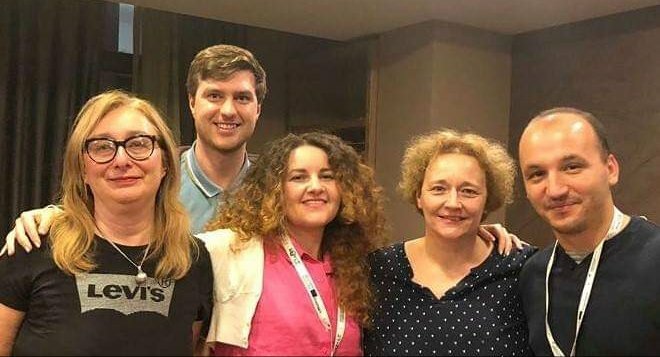 During the first day of the training course “Youth work against violent radicalisation: competencies developement”, we had the opportunity to meet and listen the input from Tatiana Petrovich Njegosh. The input was presenting an interesting reflection about the ambiguity of definitions about violent radicalisations provided also by many institutions. Definitions are already provide a vision of world, an understanding of the context. Violent Radicalisation is not only a phenomena linked what is common understood to Islamic religion or to any other kind of belif, but it is linked to the understanding of local communities, society about the complexity that we are living. Violent Radicalisation is linked with “fears”, with the contraposition among US and THEM. In each moment we can become US or THEM following different historical moments, social conditions or the “lents” that each of us is wearing to loot at reality. The opinion is based on informations, not always we have the right information, or not always we have the tools for understand what is behond the surface. Youth work should foster critical thinking and going behod the surface for create a community that is more resilience for the youth to grown in. Prof. Tatiana Petrovich Njegosh was stressing the importance to have a critical regard on the reality, on social facts and to investigate and strengh our competencies as youth workers in this sense. 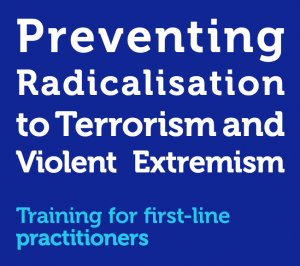 In Macerata we are starting a new training activity in the cycle of the long term strategy about the role of youth work and the specific competencies that youth workers should develop when they are asked to work about the complext topic of radicalisation and violence. 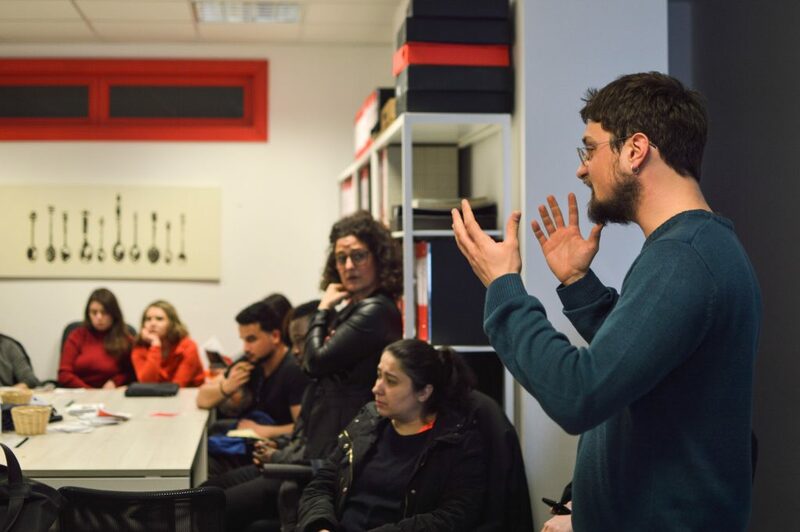 Twenty-four participants from Europe, South East Europe, East Europe and Caucasus and South Med countries are going to work for the next 4 days about their professional developement and they will share their practises with local NGOs in Macerata too. We will work on competence model about youth work preventing violent radicalisation and this work will lead to further research about the model and the training tools. The seminar ended already some weeks ago, but still there are many discussions and exchanges about tools and experiences done during this week in Tirana. 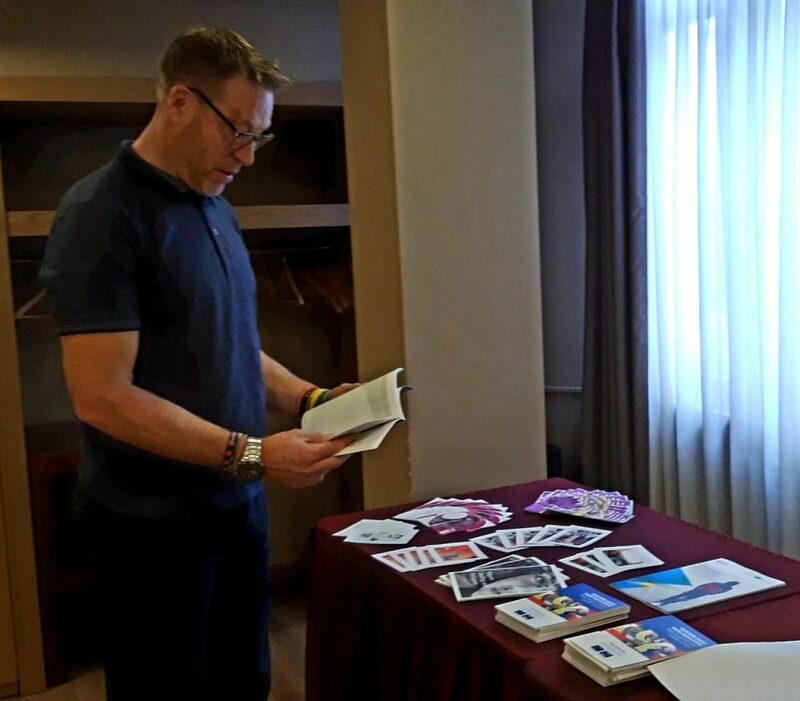 We had the opportunity to share our educational tools as youth workers dealing with radicalisation, extremism of different kinds and we had many reflections about how we will work, react, feel. Here Anna workshop presentation about Zombi and Vlado feedback about it.